The weather is warming up so many of us are starting to plan our gardens. 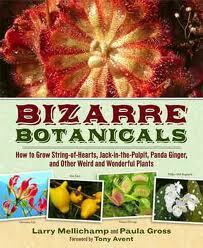 But for those looking for something outside the normal catalogs and garden guides, there is a interesting little book called Bizarre Botanicals. This little book is packed with beautiful and downright bizarre plants. Admittedly most of the plants highlighted cannot be grown outdoors in this area but maybe in a pot? There are pictures, Latin names, growing instructions and what the plant is like. Everything from Jack-in-the-Pulpit to the common and carnivorous Venus Fly Trap. Including the Titan Arum, a plant that blooms once every 8-12 years, smells like rotting meat once it does and then collapses in a heap after 3 or 4 days. The books claims that it includes information on weird and wonderful plants and it does not disappoint. Something a little different now that it's starting to feel like spring.